Battery Taper Candles - Enjoy the ambiance of candle light without the flame with a battery operated candle! This for taper candles. This battery-operated taper add the ambiance of candlelight without the danger of the flame! This version is dipped in dark-colored, sweet smelling beexwax, and dusted with cinnamon powder. Black Beeswax Dipped Timer Taper. This battery-operated LED taper candle adds the ambiance of candlelight without the danger of the flame! This version has a flickering amber light, and is dipped in tar black, grungy wax for a realistic candle look. Convenient built-in timer feature keeps candle lit for 6 hours, then switches off for 18, and back on again for 6 hours. Measures 6.5 inches high. Requires 2 AA batteries (not included). Burnt Green Battery Taper Candle with Timer, by The Hearthside Collection. This battery operated primitive grubby taper candle has a shell of green wax and has been rolled in cinnamon for a subtle scent. This is for the 4 inch length, and is the TIMER version - it stays on for 6 hours, goes off for 18 hours, and then automatically turns back on for another 6 and off for 18, and so on. The time that you originally turn the candle on will be the time it comes on each day. If you wish to reset the timer, turn the candle off and back on at the time you would wish for them to be set. Runs of two AA batteries (not included). Other sizes and colors available! Shown in the Simple Iron Stand (sold separately). Add the ambiance of candlelight without the danger of the flame! 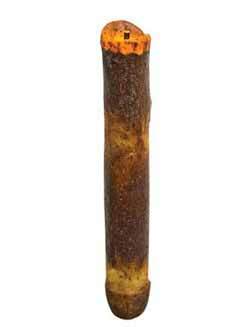 Candle is primitive-style, dipped in ivory wax and rolled in spices for a grubby look. Measures 11 inches long. This battery-operated taper add the ambiance of candlelight without the danger of the flame! Great for windowsills, dining tables, country cupboards, and more! This is for the 6 inch taper (not a timer taper). Add the ambiance of candlelight without the danger of the flame! 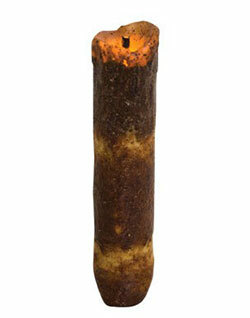 Candle is primitive-style, dipped in ivory wax and rolled in spices for a grubby look. Measures 9 inches long. Burnt Ivory / Cinnamon Battery Taper Candle with Star, by The Hearthside Collection. Add the ambiance of candlelight without the danger of the flame! 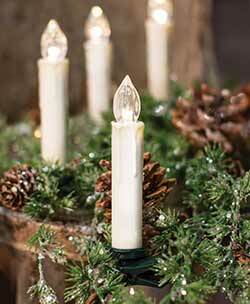 This primitive style candle is coated in ivory colored wax and rolled in cinnamon, and has a silicon star topper. Fits in most standard-sized taper holders, and takes three AA batteries (not included). Topper is attached to the 4 inch candle, so it stands about 5.5 inches tall. This battery-operated taper add the ambiance of candlelight without the danger of the flame! This is for the taper that has a TIMER. 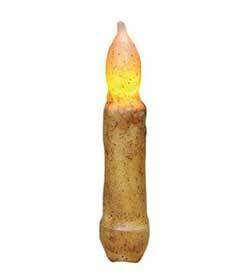 This battery-operated taper add the ambiance of candlelight without the danger of the flame! This is for the taper that has a TIMER. The timer candles stay on for 6 hours, go off for 18 hours, and then automatically turn back on for another 6 and off for 18, and so on. Add the ambiance of candlelight without the danger of the flame with this battery operated taper! Coated with ivory colored wax and sprinkled with spices for a primitive, grubby look. This is for the taper that has a TIMER - in the 9 inch size. 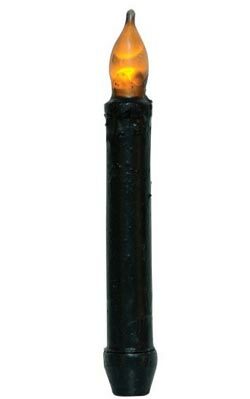 Add the ambiance of candlelight without the danger of the flame with this battery operated taper! Coated with ivory colored wax and sprinkled with spices for a primitive, grubby look. 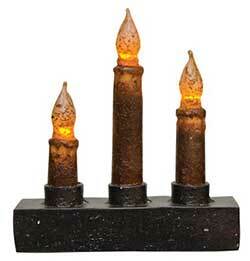 This battery-operated taper add the ambiance of candlelight without the danger of the flame! Great for windowsills, dining tables, country cupboards, and more! This is for the 4 inch taper (not a timer taper). This battery-operated taper add the ambiance of candlelight without the danger of the flame! Fits in most standard-sized taper holders, and takes three AA batteries (not included). Measures 11 inches long. This battery-operated taper add the ambiance of candlelight without the danger of the flame! Fits in most standard-sized taper holders, and takes one AA battery (not included). Measures 4 inches long. 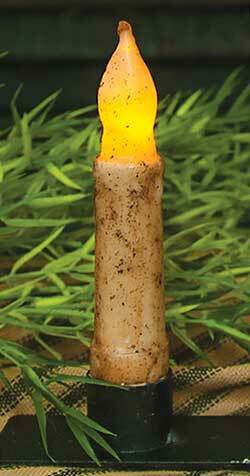 This battery-operated taper add the ambiance of candlelight without the danger of the flame! Fits in most standard-sized taper holders. Measures 6 inches long. This battery-operated taper add the ambiance of candlelight without the danger of the flame! Fits in most standard-sized taper holders. Measures 9 inches long. 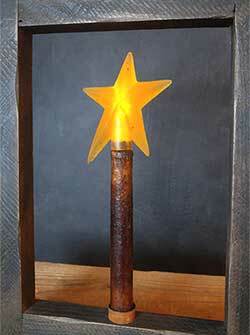 Burnt Mustard / Cinnamon Battery Taper Candle with Star, by The Hearthside Collection. Add the ambiance of candlelight without the danger of the flame! 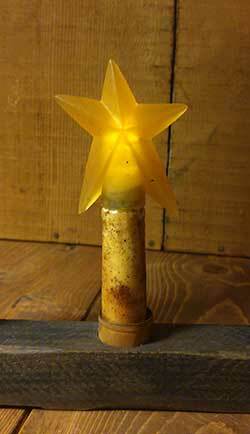 This primitive style candle is coated in mustard colored wax and rolled in cinnamon, and has a silicon star topper. Fits in most standard-sized taper holders, and takes three AA batteries (not included). Topper is attached to the 9 inch candle, so it stands about 10 inches tall. 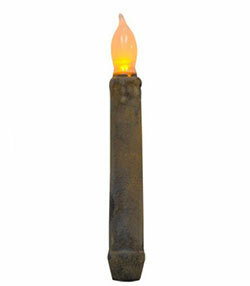 This battery-operated taper add the ambiance of candlelight without the danger of the flame! This is for the taper that has a TIMER. Measures 4 inches long. This battery-operated taper add the ambiance of candlelight without the danger of the flame! This is for the taper that has a TIMER. Measures 6 inches long. Add the ambiance of candlelight without the danger of the flame with this battery operated taper! This is for the taper that has a TIMER - in the 9 inch size. Burnt Mustard / Cinnamon Nook Battery Operated Candelabra with Timer, by The Hearthside Collection. 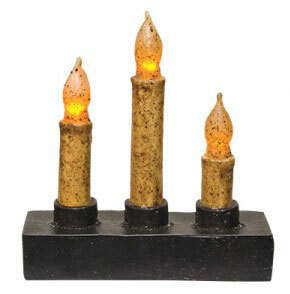 Add the ambiance of candlelight without the danger of the flame with this battery operated taper! Coated with mustard colored wax and sprinkled with spices for a primitive, grubby look. Three taper candles are set into a heavy resin base. Takes 2 AA batteries (not included). Flame does not flicker, just casts a soft glow. Base measures 5.75 x 1.75, stands 6.5 inches tall. This has a switch, as well as a timer function. Coated with grubby burnt mustard wax, this candle great for a shelf, table, or windowsill. Textured with cinnamon, with a heart and arrow design on the side. This battery operated primitive grubby taper candle has been rolled in cinnamon for a subtle scent, and the faux wick creates an illusional glow of a real candle with a glowing wick. This is for the Burnt Ivory color, in the 6 inch length. 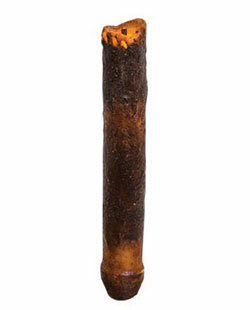 This battery operated primitive grubby taper candle has been rolled in cinnamon for a subtle scent, and the faux wick creates an illusional glow of a real candle with a glowing wick. This is for the Burnt Mustard color, in the 6 inch length. This battery operated primitive grubby taper candle has been rolled in cinnamon for a subtle scent, and the faux wick creates an illusional glow of a real candle with a glowing wick. This is for the Burnt Ivory color, in the 4 inch length. It is a TIMER version. Set of 10 elegant ivory taper candles bring a classic element to your country farmhouse or Christmas decor! Mount to trees, wreaths, baskets or more. 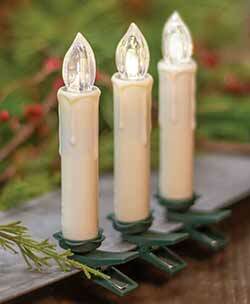 Set of 10 elegant white taper candles bring a classic element to your country farmhouse or Christmas decor! Mount to trees, wreaths, baskets or more. 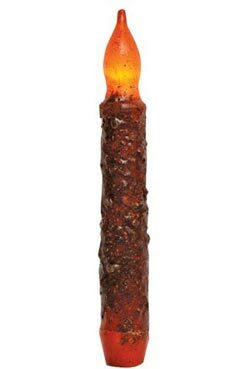 Orange Textured Wax-Dipped LED Taper Candle, by CWI. Flickering battery operated taper candles with a rustic country touch! 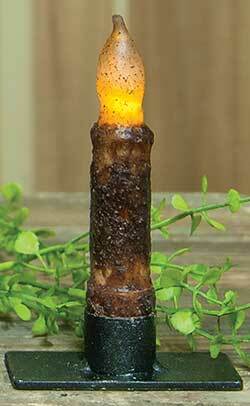 This taper has been dipped in textured dark orange wax for a realistic, grungy candle look. Over 120 hours of light. Measures 6.5 inches tall. Requires two 2 AA batteries (not included).